Intended for front disc brakes only, the re routing and reverse pull the of opperating arm gives a more direct route and posotive feel for the front brake. It does indeed work, and is very inexpensive to do. 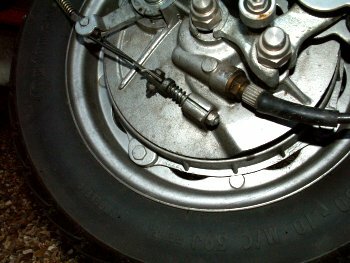 Although this modification can be done on a drum as well, it is not recommended as in time when the shoes become worn the brake can have a tendancy to lock up entirley without the user being able to release them. The original conversion was carried out by Aurthor Francis, which of course is now AF Rayspeed. Quite simply this conversion needs no extra new parts other then a 10mm nut and a washer, plus the parts you have already. You can now fit the adjuster to the lugs on the brake backplate where you just took the top out out of. 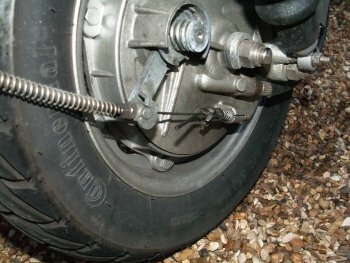 To do this slide the thread bolt part of the adjuster with the spring already on it, into the lugs from the back to wards the front, i.e. the part of the adjuster that takes the cable should be pointing backwards. 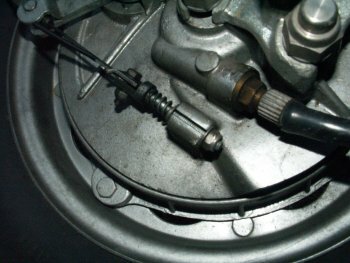 On the thread that comes out, with a suitable washer and a 10mm nyloc nut. Un route the cable as far as where it comes out from the top of the forks, re position as in this picture here. 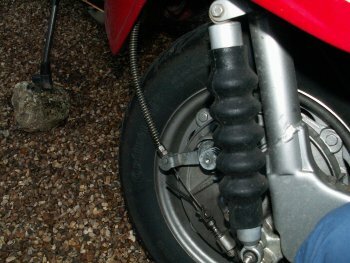 It will be best to take your front brake lever out of the handle bars at this stage and pull the inner out at least half of the way. Route the outer cable as shown in this picture, and trim to suit its new length using good quality cutters or hacksaw. Fit the trunion that you took off the adjuster back into the disc operating arm, then on that hold the top hat, thread the inner cable back through so it passes through both these parts, continue until the cable is pulled all the way through. Finally re clamp the cable in the adjuster to suit the new shorter length, once you are happy this is working correctly trim the remaining access cable to length. Copyright © Lambretta Club of Great Britain.